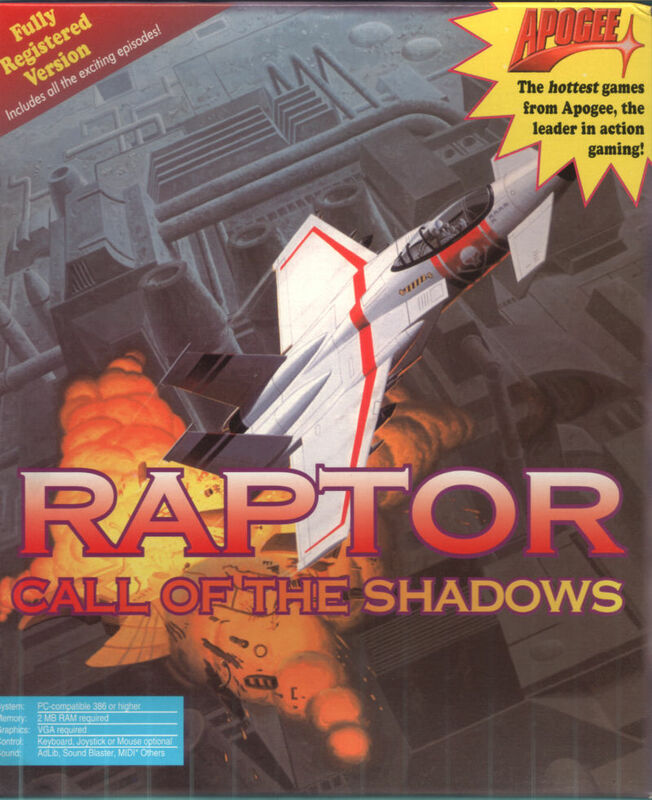 [Review] Raptor: Call of the Shadows – I ❤ Old Games! Raptor: Call of the Shadows is only one of the games heirs of the long tradition of one of the oldest video games genre, the shooter. It’s even one of the major hits (at least technically speaking) for Apogee, the company which had its golden age in the early 90s with games such as Duke Nukem. I started playing Raptor in 1995 the year after I got my first PC when I found it in a bunch of games a friend of mine borrowed me for a couple of weeks. It’s a shame it’s only a one-player game! I want to be honest, I’ve never been a huge fan of the shoot ’em ups. Maybe I was born in the wrong era, I only watched the tail of the golden age of arcade shooters, I missed the boom of Space Invaders and I started to enjoy some of the most iconic titles only very recently: I tried and enjoyed for example Defender, Galaga and Galaxian only this year. However in the old days I have to admit I tried any kind of game and talking about the shooters (horizontal or vertical, even if I have an unjustified predilection for the vertical) the two I played the most were Raptor and the almost forgotten and slipped through the cracks Tubular Worlds (I think just because it was in a cheap game compilation). And I kinda liked it! Lately I’ve read that Raptor got a wide praise from the critic so this time I was quite farsighted! Raptor received very good reviews regarding the graphics and I can only agree with them. Every scenario is full of colour, detailed and the game do not suffer any slow down even when the action is most intense. It’s quite simple after all but sometimes is better to do something simple that works instead of something too detailed that in the end fails. As you can imagine the game is rather easy, at least concept-wise. You have to fly yor jet through a sort of light version of a bullet hell until the end of the level when you’ll find the classic boss you have to fill with lead in order to destroy it. The game is divided in three macro “worlds”, called sectors: Bravo, Tango and Outer Regions and each sector is divided in 9 levels, called waves for a total of 27 different scenarios. Needless to say, the best ones and the most various are the last 9 (Outer Regions). The aim is obviously, to destroy everything that appears on the screen, in the air or on the land and every “kill” gives a number of credits proportional to the strenght of the target. Collecting credits is vital since the jet can be upgraded and boosted with deadly weapons and shields, fundamental to advance through the game. There are four difficulty levels, Training, Rookie, Veteran and Elite. In comparison to other shoot ’em ups, Raptor jet is very durable and doesn’t fall in pieces everytime is hit; on the other side, there are no “lives” to spend so once you’re destroyed, you’re dead. What can you expect from a top down shooter? Sound of missiles, bombs and explosions. So nothing special. Raptor is not an easy game and to beat it you have to be very patient, try a lot of times and be rather precise. This means that the longevity level is set to high. Luckily is not boring as some other games on the genre so it’s quite exciting to play it over and over again. So…you have to give it a try! Pingback: [Review] Burai Fighter – I ❤ Old Games! Pingback: [Review] Blake Stone: Aliens of Gold – I ❤ Old Games! Pingback: [Review] Super R-Type – I ❤ Old Games!